. Motorbike licence an advantage. The response team members are carefully recruited, selected and trained in a variety of safety and security techniques, including counter surveillance ...SALARY AND BENEFITS WILL BE DISCUSSED UPON INTERVIEW. There are 80 Recruiter job opportunities in Stellenbosch available immediately, compared to 2 in Franschhoek. 3 new job listings for this search have been found in the last calendar day, compared with 6 in the last 72 hours and 16 in the last week. 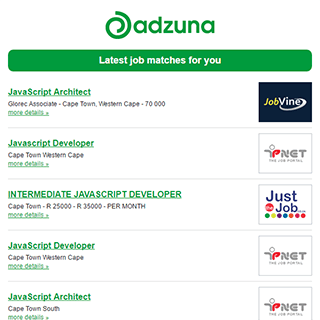 The Adzuna recency index score for this search is 0.88, suggesting that demand for Recruiter job opportunities in Stellenbosch is decreasing. Companies presently offering Recruiter job opportunities in Stellenbosch include University of Stellenbosch, PBT Group, ..
Get the latest Recruiter Jobs in Stellenbosch delivered straight to your inbox!